Over the last couple of days I had the chance to visit 5 or 6 espresso bars/coffee houses both in Olympia and Seattle all with very different personalities, customer demographics, and business models. This to me is always an amazing exercise and perspective. 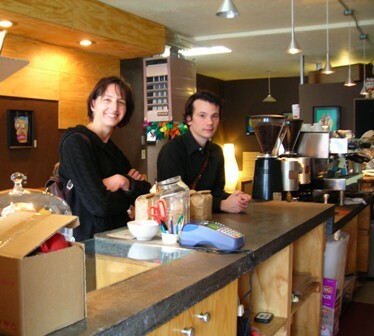 The Northwest coffee scene is inspiring and sometimes intimidating. Today, my experience was a little different and maybe I’m a little different this time around too. The coffee scene/shops are so very mature here – the baristas, the equipment, the roasters, the customers, the coffee knowledge. The coffee culture and energy around coffee seemed so deeply ingrained and routine. The businesses seemed to be more focused and settled into their niches versus the frantic search for what’s new and next. Some say this has been happening for quite some time. And maybe I’m noticing the difference because I now operate a coffee house in a part of the country where the industry is exploding with energy and opportunity. I had the chance to observe and learn a lot today. I still believe that the Pacific Northwest will continue to raise the bar for all of us, develop new technology, advance training techniques and so on. I left the day with my head spinning, my palate more refined and a sense of confidence in our vision for Tazza D’Oro and complete admiration, once again, for our exceptional coffee roaster, Batdorf and Bronson. During the drive back to Olympia on I5, Oliver, Amelia and I had some very engaging discussions about Tazza D’Oro, training, third wave coffee, espresso extraction, sourcing coffee, sustainability, potential opportunities, detail upon detail of information and brain storming. Then as the sun burned off the cloud cover Mt Rainier appeared and in an instant everything seemed so insignificant and I was presented with another amazing perspective. Hiking tomorrow either in the Olympic or Cascade Mountains depending on where there is less snow at the different elevations and mountain passes. We didn’t think about packing warmer cloths and snow gear. Oh well. But we are assured that no matter where we end up it will be beautiful. See photos from day 2 by clicking here. Sorry to say, Jim. It's been attempted many times over the last nine years all to no avail. However, I'm happy to take you up on an all paid getaway vacation. Can the folks from Batdorf come too? Hey Nick, Yes, still in Oly and headed back to Seattle this morning for a really quick trip. We head back to Pittsburgh Sunday afternoon. Call Tazza D'Oro for my cell # if you want to meet up for a drink 412-362-3676. So glad you were here Amy! Tell Nick to stop on by Oly while he is here!